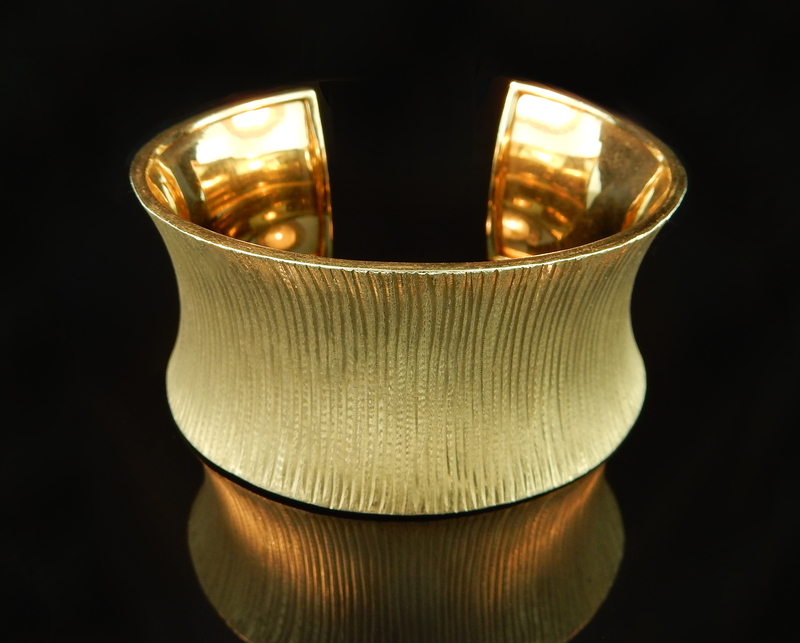 This incredible cuff is very bold. It's width makes it very unique and it fits most wrists. All created with 14k yellow gold, this piece is extraordinary. 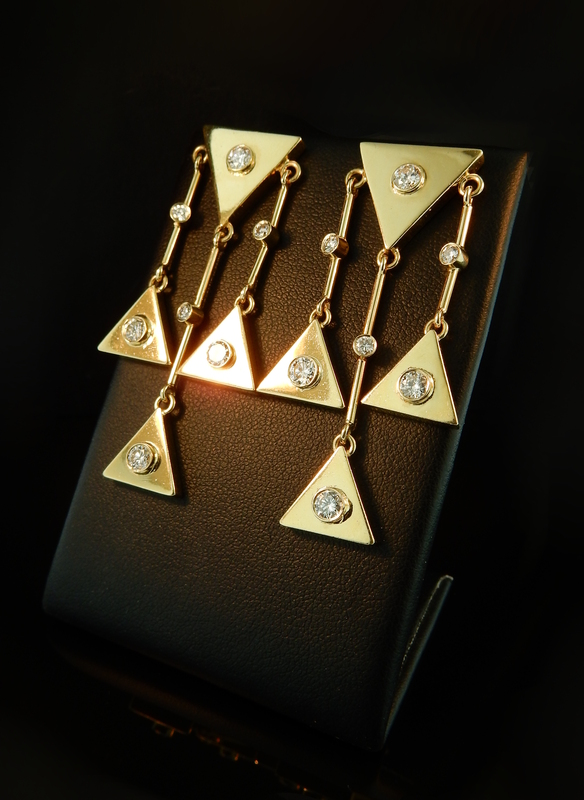 These magnificent geometric earrings include multiple triangular adornments with dazzling diamonds in the center. The overall look of these earrings is memorizing and the way they hang is truly exquisite! 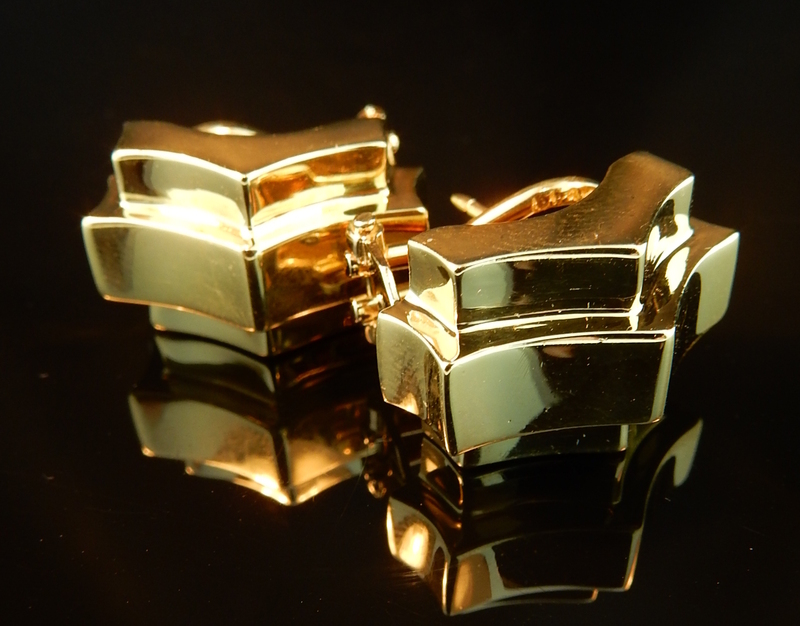 Their post and tension back make these earrings incredibly stable and make such a glamorous statement. 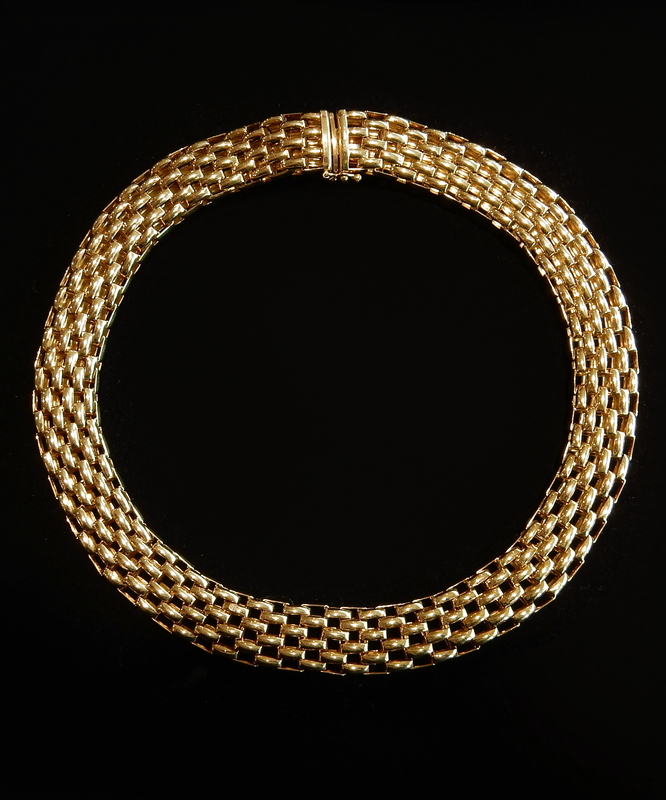 This vintage woven design choker necklace really makes a statement. Hand crafted from 14k yellow gold, this piece is so amazing! What a ring! This is a geometric vintage ring that is unlike any other. This piece is surprisingly comfortable and perfect for a night out or to wear to work. Come try it on in person! 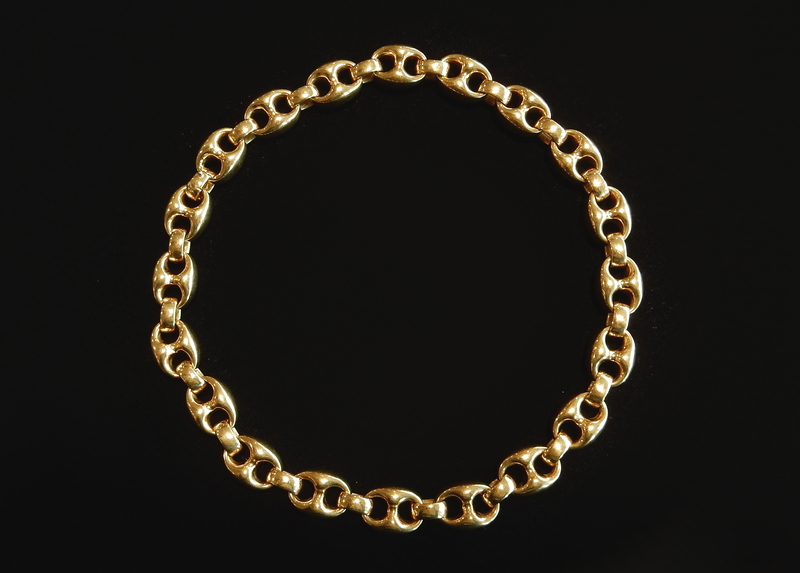 This striking gold mariner chain link gold necklace is the perfect addition to any yellow gold lover. It's heavy feel allows for maximum stability and it's eternity style hidden clasp ensures that the clasp will never find it's way to the front! 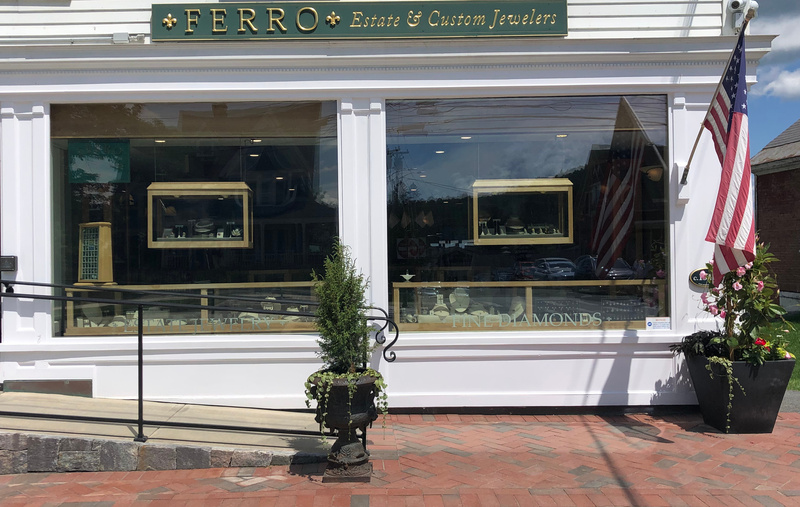 Tiffany & Co. always creates timeless designs that hold everlasting value. 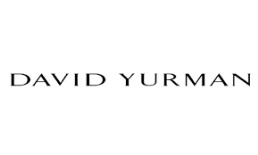 These earrings are very wearable and simple while featuring the designer name that adds incredible significance. The famous Lalaounis Greek designer created these absolutely stunning intricate dangle drop earrings. 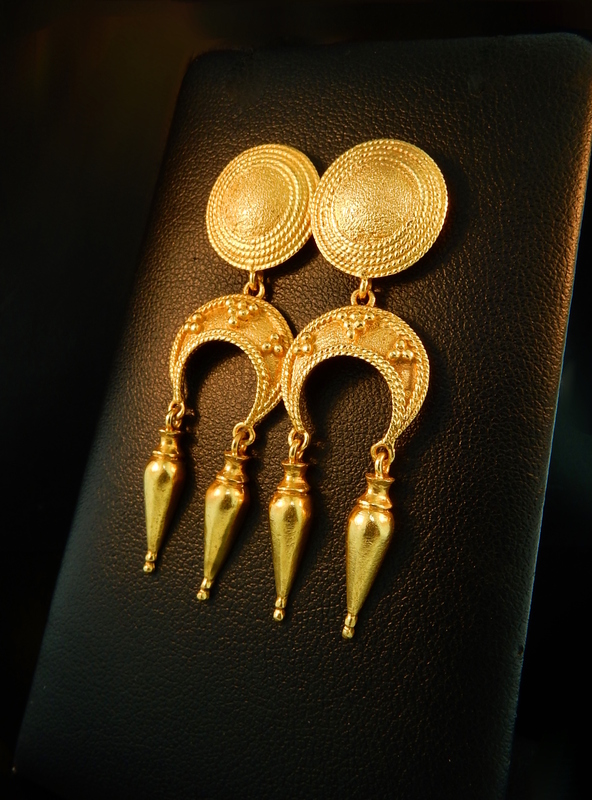 The matte finish of these earrings gives an illusion of an even higher karat of gold. 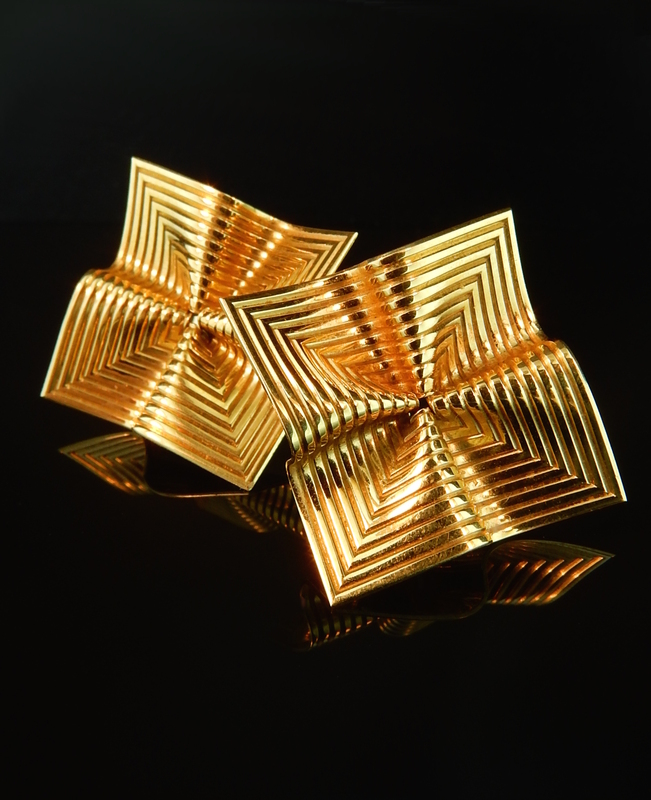 The marvelous design that is worked into these earrings has to be seen in person! These mixed finish half hoop earrings exhibit a beautiful look produced by the reputable Tiffany & Co brand. 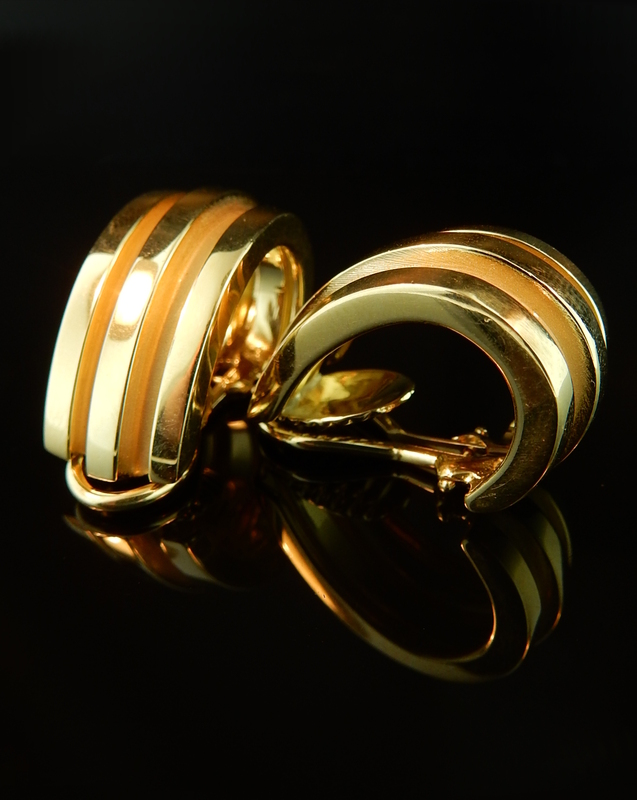 Their clip on style with omega backings is a design that has remained popular for generations. This versatile earring design is perfect for anyone without pierced ears. Posts can also easily be added if necessary! 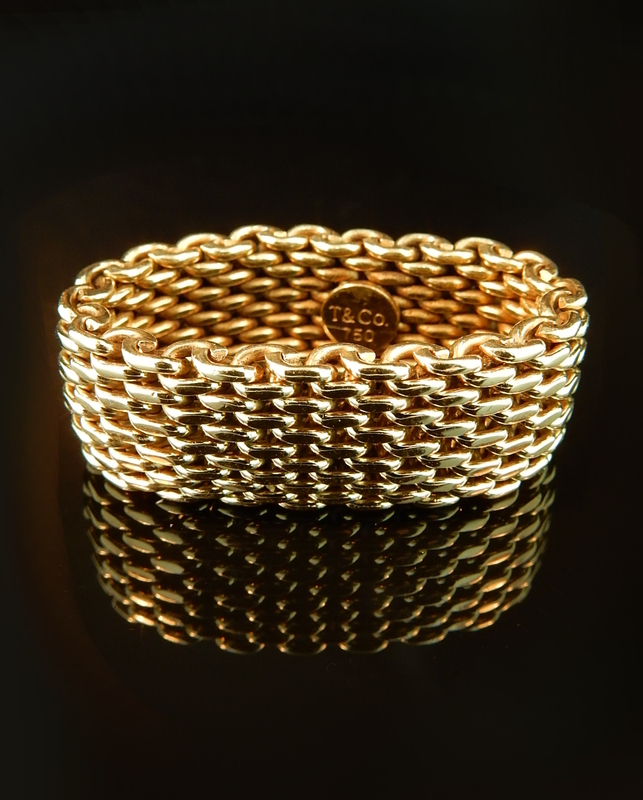 This flex band in yellow gold is very comfortable and exciting! The movement in this piece is unique and it's wear-ability makes it a perfect ring for every day. These yellow gold earrings are very unique and special. They exhibit a classic and simple Tiffany design with fun geometric angles that add a fun element to your outfit. The deep rich hue of 18k gives these earrings a burst of color in an otherwise neutral set. 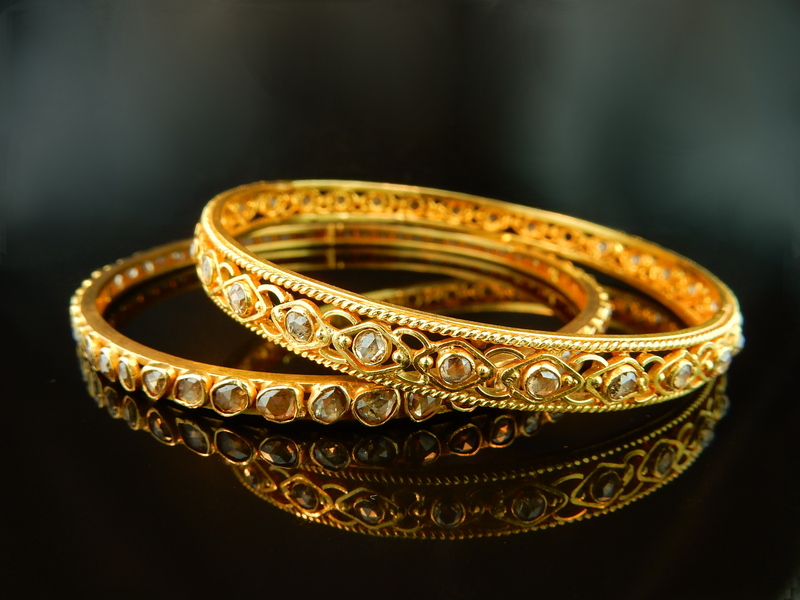 These marvelous gold and diamond bangle speaks volumes of how beautiful jewelry can be. The intricacy of these pieces is a stunning example of the detail that went into jewelry in the late 1800's. The rose cut diamonds paired with the rich 22k gold adds an authentic look to the overall beauty of these bracelets. 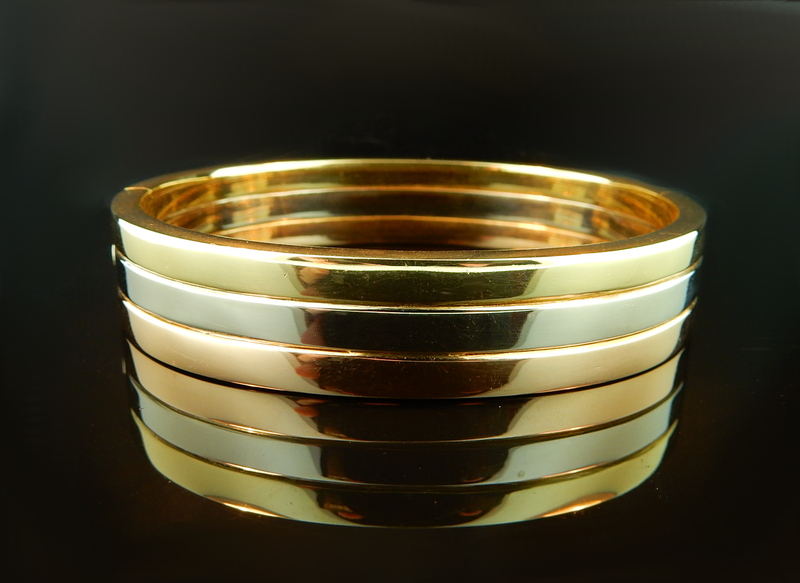 For a limited time only, get this tri-tone 18k gold bangle! It's heavyweight heft is an exciting factor in why this bracelet is so special. The three tones of gold give a wonderful contrast to an otherwise simple design.